VERY simple to get started - SVCD2DVD can create professional DVDs easily from AVI, MPEG, HDTV, MKV, h264, x264, SVCD sources. Your DVDs can have menus (including audio), you can convert PAL sources to NTSC DVDs (with no jitter etc). Simple for beginners - high quality/features for experts! CRT overscan can be handled as can custom matrices and 2 pass encoding. 5.1 AC3 audio can be preserved. Pan & scan info can be added for stubborn DVD players. * Matroska files (MKV) containing h264/x264 video and audio including AC3/AAC. * HDTV MPEG 2 transport streams can be used as assets. * Subtitles are now supported. * If your source audio is 5:1 AC3/AAC then your DVD will also have 5:1 AC3. * Nearly 60% faster than v1.5 when processing VCDs and SVCDs. * AV sync is maintained. I.e. if your sources are in sync, so will be the DVD. * Optional PAL to NTSC converstion. Choose to convert PAL assets to NTSC thus producing NTSC DVDs from PAL content. * Optional 2 pass encoding for higher quality. * Uses "pulldown" for framerate conversions. Smooth playback, no jitter and higher quality. * Can handle multi-stream audio mpegs. 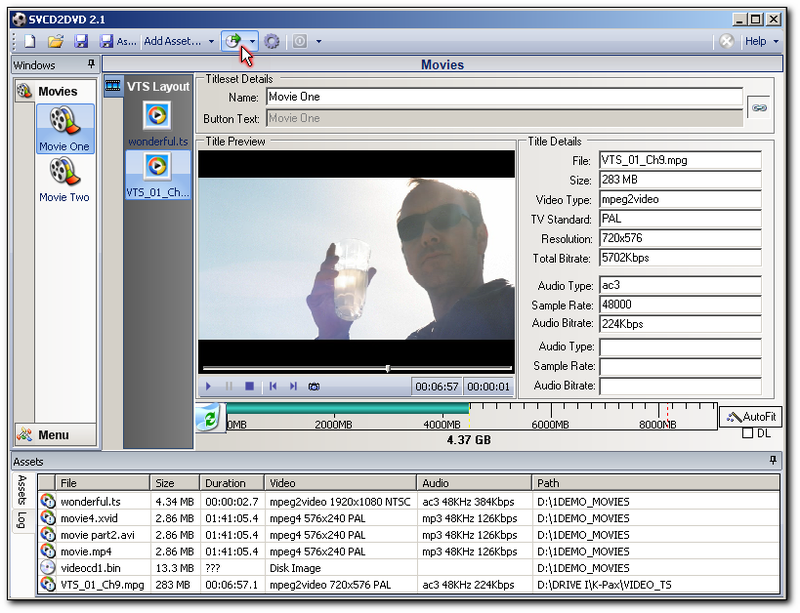 DVDs with selectable audio tracks are created. * Can handle assets with AC3 audio. AC3 audio can be "passedthrough" as is and so if you have AC3 5.1 to start with then so will your DVD. * All assets are analysed on the fly to give info about the files. Qweas is providing links to SVCD2DVD 2.5.5030 as a courtesy, and makes no representations regarding SVCD2DVD or any other applications or any information related thereto. Any questions, complaints or claims regarding this application SVCD2DVD 2.5.5030 must be directed to the appropriate software vendor. You may click the publisher link of SVCD2DVD on the top of this page to get more details about the vendor.